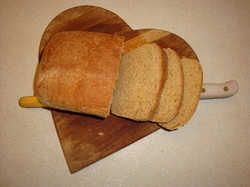 Note: I made my very first gluten-free bread from the cookbook entitled, Against All Grain. Please scroll down to order the book. No yeast, no kneading, easy, fast, delicious. The recipe is called, Old World Bread Recipe. it is delicious, perfect for any topping. Perfect. Know about the gluten-free revolution? What is it and why is it happening? There are many people sick and tired of being sick and tired. Research has revealed that gluten foods could be responsible for some of their symptoms: brain fog, Autism, ADD, ADHA, irritability, belly fat depression, pain , etc. Are you ready to experiment with a gluten-free or wheat-free diet for a month? It may be a life-changing decision for you and your family. Years ago, the only people who were gluten intolerant were those suffering from Crohn's or Celiac disease. It was difficult to purchase foods without gluten. Not so today. Most manufacturers have made gluten-free foods available everywhere. Dr. Daniel Amen, M.D., Psychiatrist has raised public awareness about the brain and Autism, ADD, ADHD. He specializes in brain health and is responsible for educating people about Gluten Sensitivity & The Brain-Gut Connection . "Scientists have hypothesized that autistic children may be more sensitive and allergic to foods containing gluten and casein (milk protein), given the strong correlation between GI disturbances and the severity of Autism. Biochemical testing has confirmed that people with autism tend to have higher levels of peptides (gluten proteins) in their urine." More and more people are no longer willing to take drugs or give their children drugs without knowing the cause of their symptoms. The public is open to learning the reasons they do not feel well. "It is said that anywhere from 6-50% of people may unknowingly experience gluten sensitivity while 1% suffer from true celiac disease". In general, gluten is poorly digested by the human intestines; this can lead to inflammation, gut damage, malnutrition, and neurological disturbances. The most common signs of gluten sensitivity are brain fog, abdominal pain, fatigue, and headache"
I am passionate about sharing this information with Baby Boomers and Beyond population, so you can choose to live a healthier longer life, free of disease and suffering. As a Health Advocate, my goal is to research most current breakthroughs and share the information with you. and beyond. I have personally worked with hundreds of people in nursing homes and assisted living facilities who are suffering from some form of Dementia and/or Alzheimer's and/or Parkinson's Disease, the 3 most prevalent neurological conditions affecting people over 55. Dr. Amen and many medical researchers in the field of brain health, Dr. Mark Hyman, MD. Dr. Mehmet Oz, MD, Dr. Stephen Sinatra, MD, believe there is a definite relationship between Gut Inflammation and Neurological Diseases. Many are suffering from symptoms which are red lights that you are gluten sensitive. I have listed below some of my favorite links for books, cookbooks, gluten-free products for your shopping convenience and education . Most books are available in paperback and kindle. You can purchase GLUTEN-FREE FOODS to add to your pantry and have them delivered to your house. Just click on the shop now links below. As a result of the immense popularity of Gluten-Free Foods, you can purchase most commonly requested foods and hard-to-find selections online and have it delivered FREE on some sites. Dr. Daniel Amen's is a member of Pastor Rick Warren's church. He saw how that most of the congregation was overweight, and/or on medications.. He saw that people in the church, like those in most churches and temples, served unhealthy foods loaded with sugar, white flour, high fat, chemicals, preservatives and the like.Pastor Warren asked Dr. Amen if he would be interested in changing the health and life expectancy of his congregation. Dr. Amen, Rev. Warren and Dr. Mark Hyman and Dr. Mehmet Oz brainstormed and compiled a series of books and programs to help people improve their health, physically, spiritually and emotionally. I have listed many of the books below for your shopping pleasure and to support your participation in this worldwide commitment. I am so excited to be one of the vehicles to promote this project. I have been experimenting with Gluten-Free diet for a few weeks now. I like how I feel. I've been buying gluten-free cookbooks as well as books informing me of the brain-gut connection linked to many symptoms I see in my clients and participants in my workshops. The trend now is to reduce or eliminate most grains, include a diet of mainly fruits and vegetables and animal protein. This type of diet is currently called the Paleo Diet, yet it closely resembles The Meditarrean Diet from years ago and is still very popular. Below I have listed my favorite books. If you are viewing this page on a PC or Mac, you will see a carousel of books to choose from. If you are viewing this page from an Ipad or Iphone, you may not see the carousel, only links. All the links include cookbooks and books to educate you about the brain-body-gut connection. Enjoy.